There are two kinds of people who call themselves “runners”: those only run, and those who incorporate strength-training exercises into their fitness regimes. The latter tend to be the most successful and well-balanced athletes. A powerful runner will be faster and less likely to suffer injuries than one who only runs and does no other form of exercise. We know that strength training and running aren’t mutually exclusive, so why don’t more runners lift weights as part of their fitness routines? Many runners don’t know where to begin or don’t recognize the importance of strength training. Others want to maximize their training by focusing on cardio as much as possible, without realizing that strength training can improve their run times, too. Think about it this way: As a runner, would you rather be a strong spring or a wet noodle? Which do you think has the most power and generates the best run times? Let’s cover the basics of muscle functionality for runners. Strength is the required, raw exertion of force to perform an action. It refers to the ability to lift something heavy, as well as the force behind pushing, pulling, etc. You can be strong without being particularly powerful, which won’t help you with running, as you have to be both strong and powerful to maximize your running. Power, on the other hand, is explosive and incorporates another, important dimension into strength: Speed. Speed x strength = power, which means strength training is an essential component into becoming a powerful runner. Below is a strength-training workout program for runners to do twice a week. Start with your typical warm up of some light cardio and stretching. Remember, these exercises are to build strength and power – not cardio. Ideally you do not run on the same day you do this power workout. Stand on one leg. Hop onto a box with the same leg. Stick the landing. Hop down. Make the box as high as you can safely hop onto. Repeat 10 times for each foot. An alternate exercise is simply hopping over a line, if you struggle with knee pain or are unable to jump very high. 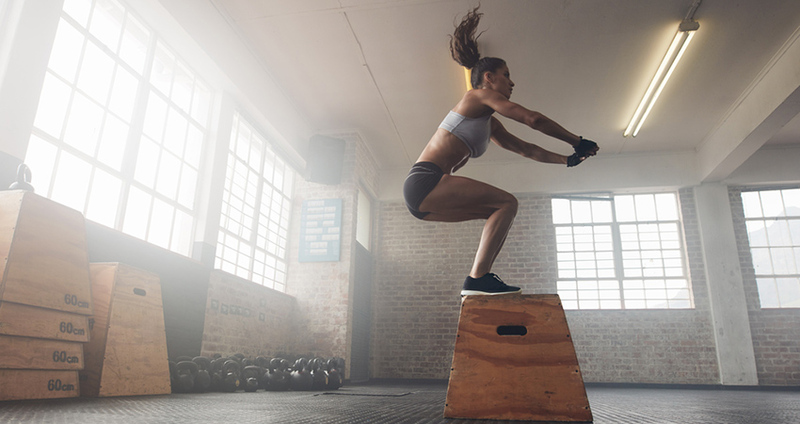 If balance is an issue, feel free to do normal box jumps, with both legs hopping up and down in unison. Start with a barbell on the floor, your toes just underneath the bar while maintaining at a hip-width stance. Bend your knees, keeping your back straight, as if you are almost going into a squatting position. Grab the bar. Your hands should be located just outside where your legs are. Look straight ahead and take a deep breath in, squeezing in your mid section. Stand up straight, taking the barbell up with you, and breathe out. Do five sets of three to four reps, in which the fourth rep is very difficult. You may need coaching on proper deadlift form. Alternate the box jumps with deadlift exercises with about 15 seconds rest in between. Then move on to the next set of exercises. Squat as low as you can safely, then jump us as high you can. When you land, make sure it is a controlled landing, maintaining squat form. Stop your set before your muscles get tried. This is not a cardio exercise. 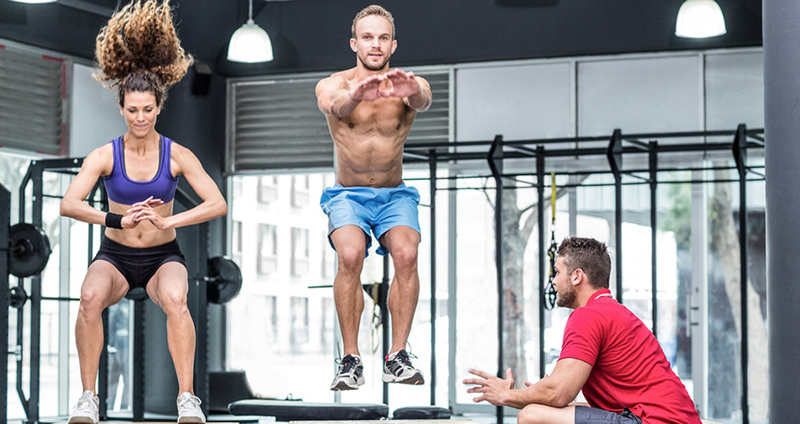 The goal is to engage your glutes, thighs and calves with high jumps. If you can do more than 10 in a row you, grab a weight and hold it to your chest to make the exercise more challenging. Set your barbell on your shoulders as though you were going to do a squat. Keep a wide stance with your toes slightly out. From here, split your feet, with one foot forward and one foot back on a comfortable base. Go into a lunge by sliding your back foot backwards while bending your front knee and dropping the hips. At the bottom of the lunge, your back knee should be just slightly behind your hip, while the front shin should be almost straight up and down to the ground. Choose a weight in which you can only complete three reps per side. You’ll begin to notice a positive effect in your running abilities after just a week of training.